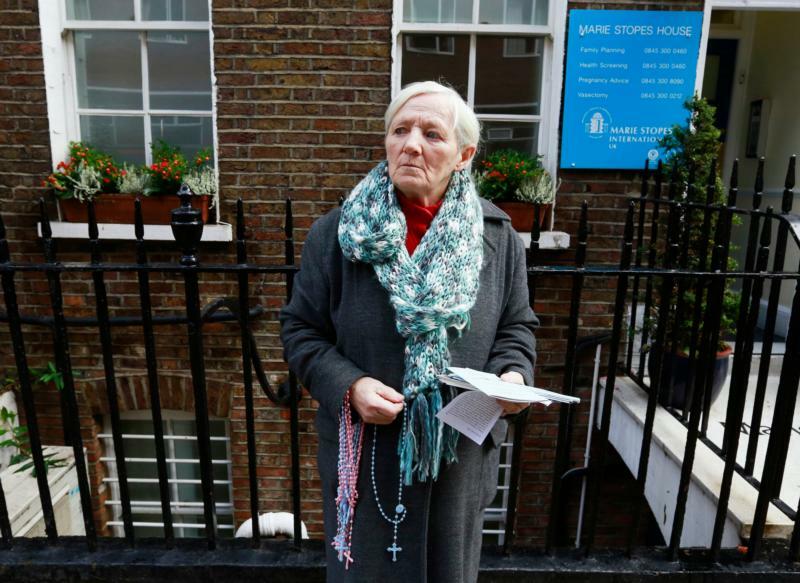 A woman prays the rosary in 2012 outside the Marie Stopes clinic in London. Members of Ealing Council, in the west of the capital, voted April 10 to establish a buffer zone around a Maria Stopes clinic, banning public prayer and offers of assistance to women within 100 meters of the building. (CNS photo/Olivia Harris, Reuters) See LONDON-ABORTION-CLINIC-BUFFER April 13, 2016. MANCHESTER, England (CNS) — A judge dismissed a legal challenge to quash the first “buffer zone” around a United Kingdom abortion clinic. High Court Judge Mark Turner said that Ealing Council in London was justified in creating a 328-foot exclusion zone around a Marie Stopes UK clinic. The Marie Stopes network offers services similar to those of Planned Parenthood in the United States. A challenge to the council’s decision had been filed by Alina Dulgheriu, 34, a native of Brasov, Romania, and a convert to Catholicism, who changed her mind about a scheduled abortion after she was approached by pro-life activists outside the clinic in the west London neighborhood. Dulgheriu now is the mother of a 6-year-old girl and she claimed that other women will not be able to make a similar informed choice if pro-life counselors are forbidden from handing out literature or approaching the clinic’s clients on the street. “There was substantial evidence that a very considerable number of users of the clinic reasonably felt that their privacy was being very seriously invaded at a time and place when they were most vulnerable and sensitive to uninvited attention,” Turner said in the decision. “It also follows that, in this regard, I am also satisfied that the defendant was entitled to conclude that the effect of the activities of the protesters was likely to make such activities unreasonable and justified the restrictions imposed,” the judge said. Dulgheriu told Catholic News Service July 3 that she felt sorry for other women agonizing over unplanned pregnancies. Dulgheriu had argued that the buffer zone violated human rights laws guaranteeing freedom of association, expression and freedom of religion, as well as stopping people offering help to women who feel abandoned. A former nanny, Dulgheriu had traveled to the U.K. in 2009 to work look after three boys of a London family. In 2011, she learned she was pregnant shortly after she split up from her boyfriend, who then pressured her to get an abortion. She scheduled an appointment at the clinic, but changed her mind when approached by a member of Good Counsel Network, a pro-life group. Network members, she said, later found a new home for her when she was fired from her $130-a-week job after her employer discovered she was four months pregnant.